You can kind of see it here, but only if you are looking for it. Zane has never been able to stick his tongue out. 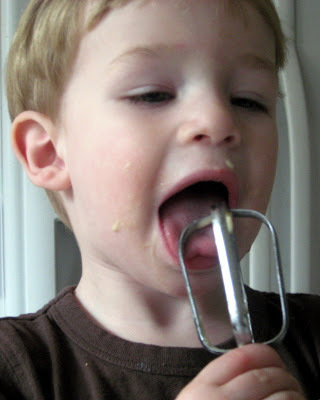 In this photo you can see he cannot lick the beater very well. He had a tongue tie. The tip of his tongue would not go past his teeth. See the telltale heart shape? My mother had a tongue tie and it was never taken care of until she was 11. It effected her speech, eating and more. Zarek also had his tongue tied and had his cut at the doctor’s office 3 days after he was born. We actually left the hospital a little early so we could go and have it done, because it was effecting breastfeeding. It was a quick procedure faster than his circumcision and it did help the breastfeeding. I think for Zane it effected breastfeeding. It was even hard to get him to eat from a bottle. We were pretty sure it was effecting his speech his ts and ls were not coming out right even when we worked hard on them. I was also wondering if it was effecting his sleep. When I saw that he could already tell he was different when he saw his brother stick out his tongue I knew I wanted it taken care of. After it was done he was fine besides not liking to come out of the anesthetic. He could already stick out his tongue at us. We have seen an improvement in his t sounds and it was fun to see him able to roll food around in his mouth. And of course we got him an ice cream cone so he could lick it! What is a tongue tie? What are the effects? Want more information. Here is an interesting site I found that goes into more depth about the tongue tie: TongueTie.Net. Or see what WebMD says about it. Wow! Thanks for the information. I have never heard of a tongue tie before! Yeah, a lot of people I mention it to say that they always just thought it was a saying that they didn’t know it was a real thing. Awww, YAY! Glad it is taken care of. Nicky and Dash both have a minor one, thanks to their Dad. ) He never had his taken care of. It isn’t really, really bad, but they all have one and it keeps them from sticking their tongue much further than their lower lip.